Footprints from searchers remain in mud at the edge of a deadly mudslide on March 25 in Oso, Wash.
Geologists say this month’s massive mudslide in Washington state was probably triggered when the Stillaguamish River undercut a slope already weakened by the relentless rainfall of recent weeks. “When you have a really steep bank made out of loose material, with the river eroding out the toe, that’s a recipe for one of these slides,” said University of Washington geomorphologist David Montgomery. A geologic map of the area published in 2003 noted the high landslide hazard, and the same spot was hit with a smaller slide in 2006. Nevertheless, the size and force of the wall of mud that barreled across the river came as a surprise, Montgomery added. Western Washington is replete with similar nightmares waiting to happen, but geologists have few tools to identify which slopes are primed to fail. The best indicator is the past. Slopes that have collapsed before are likely to fail again. The question that’s almost impossible to answer is: When? The intervals between major slides can vary from a few years – as was the case for the slope near the town of Oso – to centuries. Landslides are part of the Northwest’s geologic heritage – and perhaps our least appreciated geologic hazard, he said. The glaciers that sculpted our landscape and created high bluffs also left behind the sandy, crumbly soils that make slopes prone to collapse. Wet weather doesn’t help. As rain percolates through the soil, it can accumulate in deep layers, loosening the frictional bonds that hold the soil particles together, said Tim Walsh, chief of geologic hazards for the Washington Department of Natural Resources. 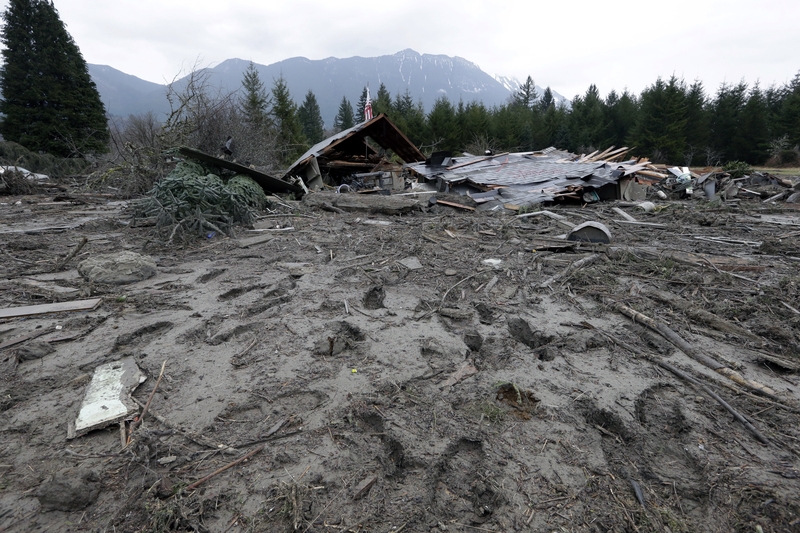 Most of the region’s big landslides strike in late winter and early spring, after an entire season’s precipitation. Gravity delivers the final blow. “The steeper the slope, the more force you’re putting on it,” Walsh said. The 2006 slide, which spilled into the river and altered its course, created a kind of natural retaining wall that was temporarily stabilizing the slope at its base – and which could have been washed away, Walsh said. The presence of geologic faults can also raise the risk of landslides, even when the ground doesn’t shake. There’s no evidence of seismic activity that could have triggered the slide, said John Vidale, director of the Pacific Northwest Seismic Network at the University of Washington. But the Darrington-Devil’s Mountain Fault, which roughly parallels the Stillaguamish River, is an area where past earthquakes have fractured the ground and weakened it, Vidale explained. Motion on the fault over the eons might also have created a more deformed, unstable landscape, he added. Several area residents speculated that logging might have played a role in the slide. There’s no doubt logging can lead to the kinds of shallow landslides that are common in the Northwest, because vegetation helps hold the soil in place, Montgomery said. It’s less clear what role logging might play in so-called deep-seated landslides like this one, where an entire hillside gives way. Logging can increase runoff, which can contribute to slope destabilization. But many factors contribute to a major slide, he said. For homeowners, assessing landslide risk can be tough. The Department of Natural Resources publishes geologic maps, but they’re mostly incomprehensible to a layperson. County and local land-use plans usually designate landslide-prone areas, but residents often balk at building restrictions.